A Southeast Asian Buddhist shrine made of wood that had drifted in the sea was found on the Vakarai beach Wednesday. 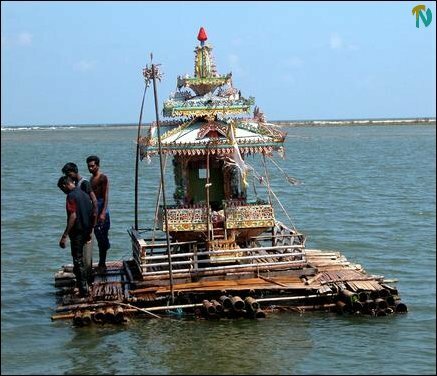 Crowds from the Tsunami devastated village flocked to see the curious floating shrine. The decorated structure was borne by the tide through the estuary of the Vakarai lagoon and beached in the early hours of the morning Wednesday. Vakarai is 64 kilometres north of Batticaloa. The shrine appears to have drifted across the Bay of Bengal from the Thai coast following the Boxing Day Tsunami. The statue in the shrine is missing.